This is a story of Remy, who moves to a new town to live with her biological father. There she meets Asher, the boy who has abilities similar to her own. Remy excited to meet someone who may be able to explain to her a little about her own powers. But Asher and Remy are not allowed to be friends, and they’re definitely not allowed to fall in love. So, you know I try to be honest in my reviews. Just because a book didn’t sit well with me, doesn’t mean someone else is not going to pick it up and it will be the best thing that ever happened to them. I just wanted to mention that before I dived into this particular review. I didn’t have fun reading this book. Remy is a alright enough character. She has a lot of issues in her life, and I do give her props for trying to fight thru the bad and look for the good. That is important and I’m glad we got to see Remy come out on the other side, especially with all the stuff that happens to her in the beginning of the book. Asher is an alright kind of character as well. I didn’t feel particularly swoony when it came to him. I also didn’t find him as broody as he probably was supposed to be. The tortured soul thing didn’t really come across for me from either one of the characters. On the other hand, the whole book read more like a contemporary than a paranormal. There is nothing wrong with that, I’m a huge fan of contemporary, and I do have to say that I enjoyed that aspect of the story, even though it left me confused. I guess I just expected more of the paranormal than there was, but again, it’s only book one. In my mind, this book resembled another story very closely and at times I was having hard time continuing with the reading just because I felt like I knew what was going to happen. I really did want to enjoy the book because I love the whole touch/senses aspect. Yet, this book just didn’t do it for me. After saying all that, I want to remind you that this is just my opinion. If you go out and buy this book when it comes out and love it to pieces, GOOD! I love the reading/writing community because there are so many of us with so many different opinions, you never know what you’re going to get. I love that I can be honest with you, knowing you appreciate that! With this book, I suggest you take a look for yourself. 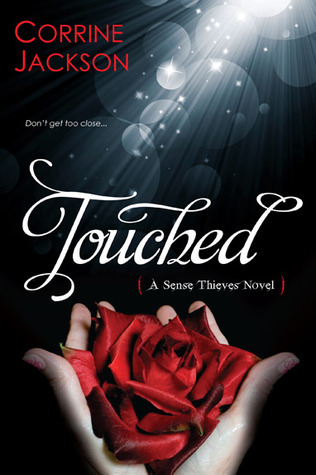 Touched comes out November 27th. I’d love to hear what you think! ← Awesome Book Deal for you!!! I'm super curious about this one, since I loved Corrine's IF I LIE, which was an amazing YA contemp. I've seen, so far, really mixed reviews of TOUCHED. I definitely want to try it for myself; still, it's too bad you didn't like it, Valia! I've had my eye on this book for a while now. It sounds like it could be really promising.